Your content is all published and you’ve registered all your social accounts. Now what? How do you get the word out about your pages and where do you focus your time? These social media promotion ideas will kickstart your marketing initiatives. But first, let’s get some of the basics out of the way. You want to make sure you’re taking full advantage of the space in your profiles. The first step of promoting your social media accounts is making sure people know where to find you. And that means getting all of your ducks in a row. This seems like a no-brainer, but you’d be surprised at what you might be missing out on. Unless you’re going for an ultra-minimalistic look, your brand’s Facebook Page should be filled out. 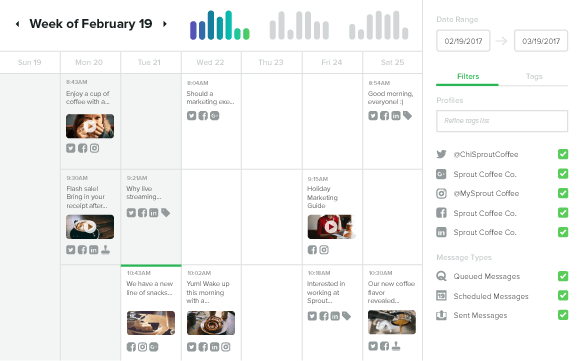 Add a monthly check-in to your social media checklist to explore new features. In the About tab, you have space to add links, including other social networks’ profiles. 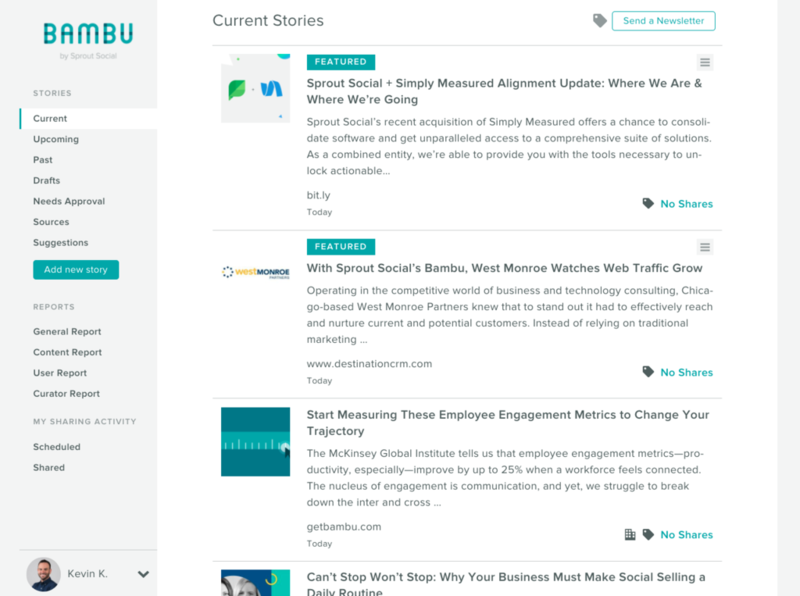 The Story section allows you to give more information about your company in a storytelling format. Article uses the About section to let customers know where else to find them. Not all the links are active, but the icons do indicate the networks. Instagram recently added the ability to link other accounts and hashtags to your bio. Originally, people had to make do with memorizing the hashtags or creatively using an emoji. Now, you can use the space to promote other location-specific accounts and add hashtags. These hashtags can be your standard branded ones or special hashtags, like for a contest. 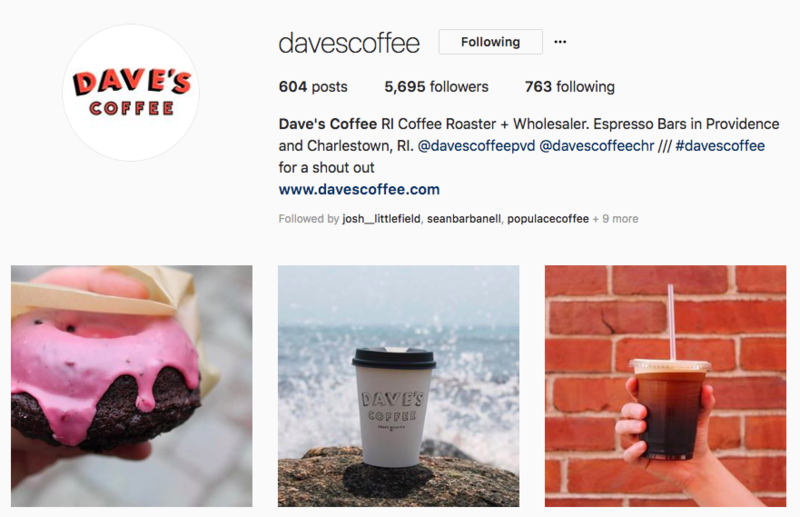 Dave’s Coffee makes use of their bio space with both location account tags and their branded hashtag. Followers are easily directed to their account and to explore their other pages. Some of the easiest cross-promotion for cross channels is occasionally reminding your followers that you have other social media accounts. It can look like a link to the social media page accompanied with a call-to-action asking people to follow the account. For a more subtle approach on cross-promotion, use space in your bio to mention that you’re on other networks. For Snapchat-heavy users, a profile photo change to their Snapcode works well. UMD Athletics is active on Snapchat and uses Twitter to promote their Snapchat code. As their Tweets come up in your timeline, you’re subtly reminded that they’re also on Snapchat. If customers are searching for you, your website is usually the first to pop up in the search results. Make it simple for them to find the social networks that you’re on. Many website themes now incorporate social media icons that you can easily fill out. Take the icons a step further by adding your brand’s graphics or colors to it. Some websites use short banners while others are happy with changing the color. If you’re sending newsletters out on a recurring basis, add the social icons at the base. It’s another subtle reminder to the recipients that you’re there if they need to find you. For a more direct approach in promoting your social media accounts in your newsletter, add a fan section where you showcase a photo from the community. Most newsletter services allow for embeds. But if yours doesn’t, a photo upload with an account link will do. If your company often emails externally, like to potential sales clients, add links to your email signature. This is another branding opportunity and should be used to its full potential. 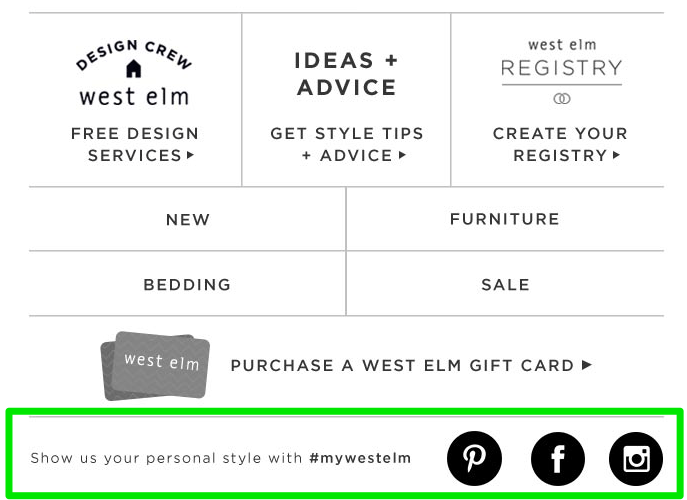 At the bottom of the West Elm newsletter, they add their social icons and their branded hashtag. It’s a call to action for customers to share a photo, use the hashtag and follow them on a network of their choosing. In this second section, we’ll take a look at a few ways you can promote your accounts with an end goal of driving sales. 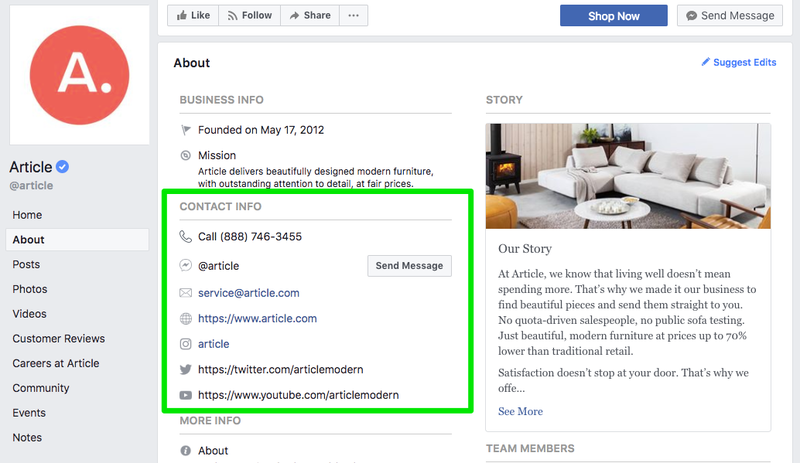 Depending on your business, these sales can be captured directly from social media or show up as referral links in your website. There are many ways to target someone with ads on Facebook. To begin with, you can add the Facebook Pixel to your website. Once you’ve done so, you can set up ads to target website visitors automatically. Take advantage of Facebook’s audience data to target interest groups. If you’ve recently shopped online for shoes, you may notice that you’re receiving more shoe ads than before. That’s because Facebook noted your shopping habits and added you to that interest category. 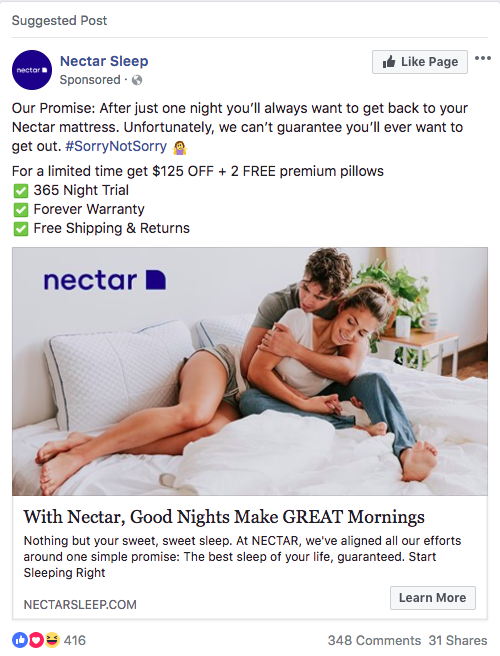 Despite never having heard of the company, Nectar’s ad showed up because we clicked on another mattress ad. Once your ads are set up, use a tool like Sprout Social to manage the comments you’ll inevitably receive. Never miss another potential customer’s question again. A feature available on Instagram and Facebook, shoppable tags are a must for retail brands. They identify your products to your customers and customers can easily purchase from your website through the tag. 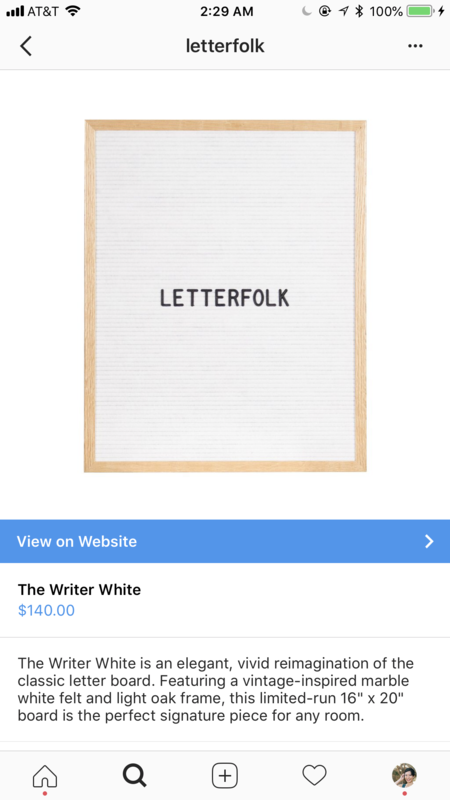 Letterfolk uses Instagram’s shoppable tag in the post. Clicking on the tagged product leads you to the product page and a short description of it. In traditional advertising, you see weekly deals in the newspaper or receive discounts in email. Social is no different. These discounts are served to a certain segment of your audience and end after some time. The simplest way is to offer a code in a post. Experiment around with social-only discounts. Try doing flash deals with limited quantities in Instagram Stories or posting an Offer on Facebook. 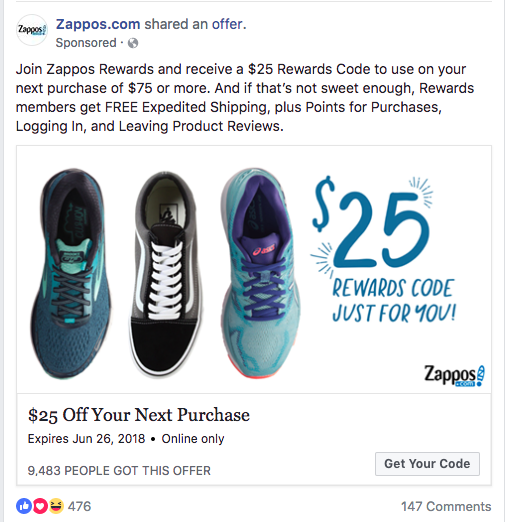 Zappos posted a Facebook Offer for $25 off your next purchase. It’s promoted only on Facebook and the Offer option makes it easy for them to track who takes advantage of it. In this third part, we’ll address a few social promotions you can take on with a goal of getting your brand in front of as many people as possible. Your success metric here is usually the number of impressions. These are a no-brainer for brand awareness. Setting up a low-barrier contest for your brand is simple and there are many examples of successful contests. The easiest giveaways are those where the fans have to do very little to enter. These are also the highest in engagement. If you’re just starting out on contests, we would recommend this route. If you want to up your game, try a user-generated contest where there’s a hashtag specifically for the event. 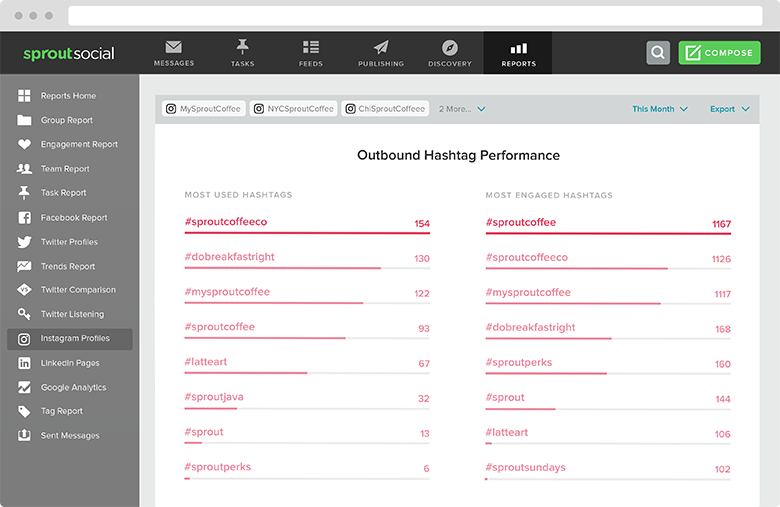 To monitor and respond to entries, use a hashtag tracking tool like Sprout Social. Our reporting feature will also track how successful the contest campaign was. In this post, Tarte Cosmetics used both shoppable tags and a contest to drive interest for their new product. Also note that they added some branded hashtags to the caption. Writing the same copy for every network won’t get you the best results. Your audience on LinkedIn is likely not the same as the one on Facebook and that’s okay. You may use the same photos or videos but your copy should change. After examining how your audiences are different, experiment with various tones and vocabulary. If your sales partners are mostly on LinkedIn, then your copy will be more sales-oriented. If your audience on Snapchat is younger, then you’ll use more gifs and memes. Adobe used an embedded video on LinkedIn to ask their audience their thoughts about artificial intelligence. It’s a hot topic and many people chimed in. Employee advocacy is quickly becoming a major source of content amplification for brands. With the help of your loyal staff, you can encourage them to promote specific and tailored messages directly to their social channels for further reach. If you know your campaign has a likely target audience matching your employees, get them involved with easily shareable content. The best way to do this is through employee advocacy tools like Bambu. This software allows brands to get serious exposure to new and qualified audiences. And it’s all done by by aligning your organization with the social media networks that belong to your employees. The entire idea of an ambassador program is based on brand awareness. You work with passionate customers who want to talk about your product to all their friends. It’s naturally designed for brand awareness. Creating and supporting an ambassador program takes time and patience. If you don’t have the resources, consider setting up a loyalty or referral program instead. Hand your loyal customers some referral codes and reward them with a discount when their referral purchases. Once this has launched, you can announce this on social media and let customers know when you comment on their posts. All of your social media efforts would be moot without some amount of measurement. 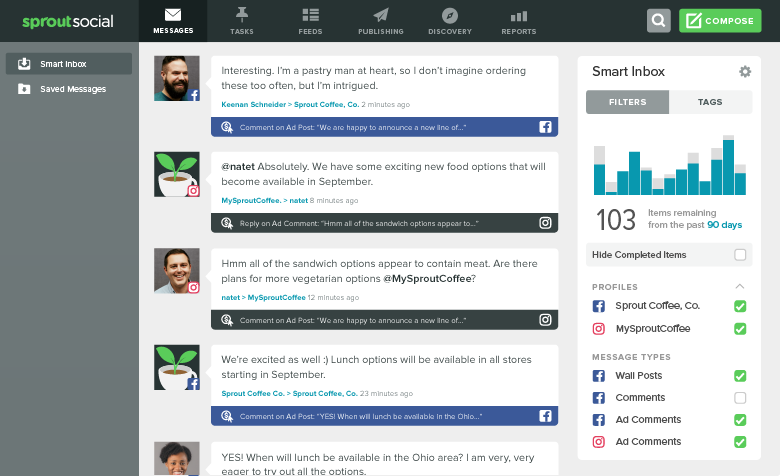 Track your campaign successes and failures through a reporting software like Sprout Social. As the social accounts grow and you try out new ideas, you’ll need to manage your posting schedule more effectively. Our posting calendar makes it easy to see where you’re missing posts. Lastly, this isn’t an exhaustive list of ideas. There are plenty more out there to try and new features are being released on social media every month.